With the shutdown of Aereo, which I blogged about earlier, I decided that I needed to come up with a quick solution to fill my TV needs. I've never had a DVR before, but I became hooked on Aereo's DVR feature. It was very nice to be able to record NFL and MLS games and other TV shows to watch them later. My needs aren't very big. My family hardly watches any TV. There are a couple of shows that we watch regularly, though. One of them is on ABC. We used to watch on ABC's own website, but ABC started making us wait at least a week to watch because we don't have cable TV anymore. This really is aggravating! I'm sure that this trend will only continue as people continue to "cut the cord." Thus, I decided that I needed a DVR. First, however, I needed a working TV signal. There was a Real Salt Lake game on later in the day and I needed to watch it! I double checked Aereo and it really was dead. I needed an antenna to receive over the air TV signals. I know that installing an antenna outside will always give the best results, but I decided to see what I could do with an indoor antenna. I found that the Winegard Flatwave Razor Thin antenna was getting some good reviews. There were other antennas getting good reviews too, but I needed something I could get locally. Time was not on my side and game time was quickly approaching. I ran into town and purchased the antenna. Before going home I tried out the antenna at my grandmother's house and I was not pleased with the results. I was tempted to return it, but decided to try it at home first. I fought with the antenna for several hours. I still don't know why I struggled so much with it. My Vizio TV kept giving me a generic "Scan Error" message as I tried to search for channels. I finally found a spot in my living room window where I could at least get it to scan enough to get signal from a few channels. After playing with it for quite some time, I found that if I unplugged the antenna from the TV before starting a scan I could get better results. I finally got a scan to complete and I had a working TV signal, but I still needed a DVR. Thanks to my good brother-in-law, I had a digital ATSC TV tuner card lying around not being used. I decided to throw this into my Windows 8.1 machine and see what I could do. I paid the $10 for Windows Media Center and I was off and running. It was a pretty simple process except for the fact that it messed up a few channels with incorrect frequencies. I used the software that came with the TV card to scan for channels and compared with what Windows Media Center found. 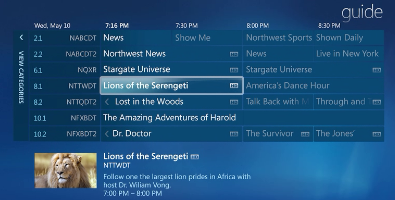 It was easy to correct the problems in Windows Media Center's lineup this way. I am quite pleased with the results. To watch TV, we hit the power button on the media center remote that came with the TV card, and the computer comes out of sleep and automatically turns on the TV within a couple of seconds. It really does feel like a real TV experience without the fuss of logging in to a website to watch TV which we were experiencing before. I think we are much better off now. We might not be using Aereo if they are able to restore service to us in Utah. I know that I could have accomplished good results with free software, like Myth TV, but I needed things to work quickly without fussing with config files and package dependencies that come with Linux distributions. I would love to experiment with Myth TV, though, when I have some free time. I'm not usually one to write about court decisions. They usually don't directly effect me, at least noticeably. However, I am quite upset about a ruling by US District Court Judge Dale A. Kimball. He ruled that Aereo should be shut down while we wait to hear what the Supreme Court will rule on the matter this summer. Are you kidding me? The Supreme Court will hear the case, but he enforced a preliminary injunction in the tenth circuit states? Does this sound reasonable at all? Every other case against Aereo has been ruled in favor of Aereo. In the good old tenth circuit, however, we go our own way, I guess. I am extremely disappointed in this ruling. I have grown quite fond of Aereo's service. Having over the air TV signals available via the internet is completely awesome. Their cloud DVR absolutely rules too. I loved being able to record NFL games this season and watch them later from any of my devices. I'm really going to miss this service. I don't anticipate it being turned back on any time soon. These battles tend to drag out for a long time. Recently I have been trying to help someone at work with a broken Samsung Galaxy S3. The device will not power on whatsoever. 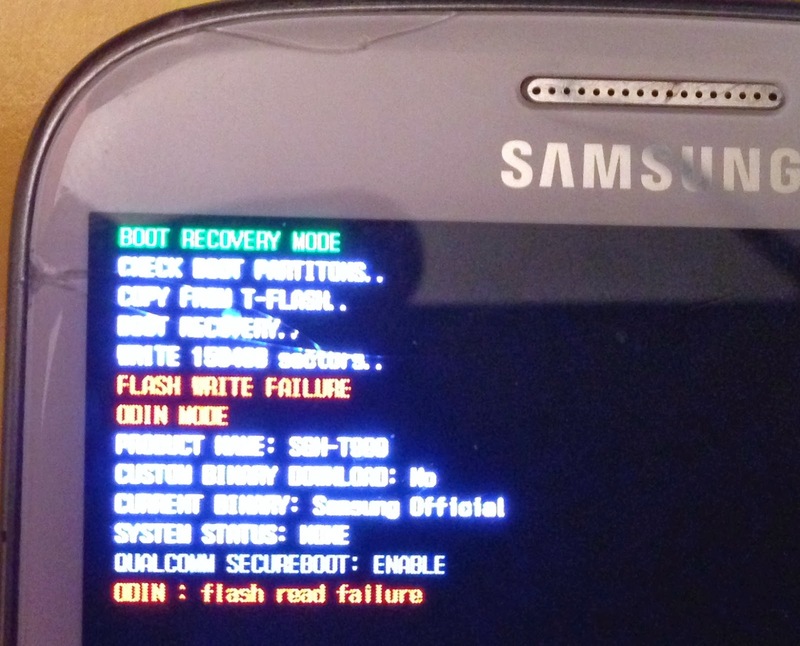 After doing some research I discovered that the S3, like most Android phones, will not power on the screen if the boot loader has become corrupted. After doing more research, my conclusion is that the flash memory on this phone became corrupted. There is no way to read or write an image to this phone anymore. This is not the first time I have seen similar problems with Android hardware. I have never seen an iPhone do anything like this. 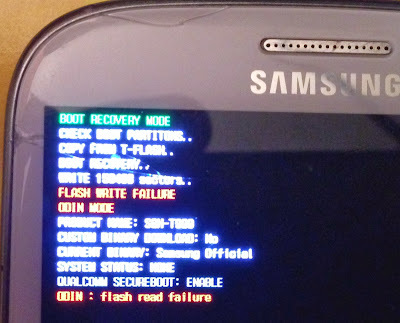 I need a phone that I can depend on that won't randomly decide that its flash memory is suddenly corrupted.